South Africa’s President Cyril Ramaphosa says 70% of all the proceeds raised from the annual Presidential Golf Challenge will be spent on a national campaign to eradicate pit latrines at schools. 2019 Presidential Golf Challenge. 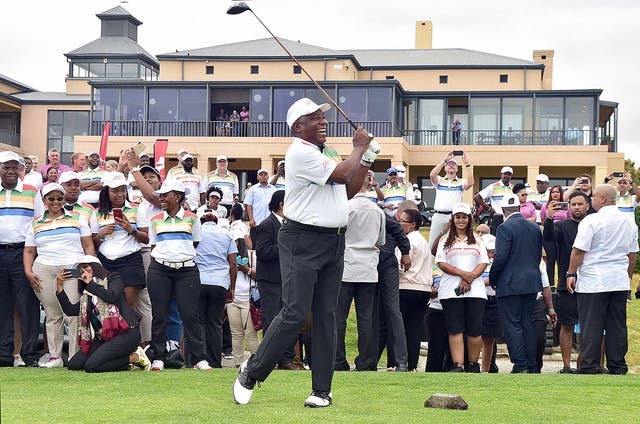 President Cyril Ramaphosa joined business leaders and other stakeholders at the annual Presidential Golf Challenge at the Atlantic Beach Golf Estate, Melkbosstrand, in the Western Cape. In August last year, the President, together with Basic Education Minister Angie Motshekga, launched the SAFE initiative, rallying leaders of business to pledge their support towards the eradication of pit latrines in schools. At the State of the Nation Address (SONA) on Thursday, President Ramaphosa said nearly 4 000 schools still have inappropriate sanitation facilities.